I want to start writing or give a conference talk. I’m just not sure what to say that hasn’t already been said. I wrote a post, but it’s really boring. I’ve been trying to put together a talk, but I feel like it’s all stuff people already know. Do any of these sound familiar to you? Over the years of writing my own blog and regularly giving talks at conferences, I’ve found myself fielding these kinds of doubts from people I meet. They have a strong desire to share their experiences and engage with their community, but are stuck on how to get started. Each of their ideas, to them, feels commonplace, uninteresting or unworthy of being shared. So what if I write about my design process, they think to themselves, there are tons of posts and talks out there about process! So they shove their blog post in a drawer or never submit their conference proposal. There is not a single post or talk I’ve ever written that has felt original or even particularly novel to me. I’ve been working in tech and design long enough to know that there are plenty of people out there solving the same problems as me, some in the same exact way. On top of that, there are people out there who’ve shared similar stories and ideas already! Even right this second as I’m sitting here writing this post, I can’t shake the feeling that this is already-covered ground. I’ve been writing and sharing my experiences for years and those doubts still pop up each time I put something out there. So first of all, just know that it’s totally normal to doubt. Solving my own problems — I use writing and speaking as a way to explore difficult topics I encounter. My latest talk is all about the difficulties of quitting, knowing when to do so, etc. That’s not an accident! Going through that process at BuzzFeed was difficult for me and I really struggled with the decision. Speaking about it is a means for me to dig into that topic and form better opinions for myself. Being a part of my community — There is a certain strength and comfort in numbers. Reading a single post about the difficulties of stakeholder management, for instance, is less powerful than reading three or four (or finding a whole trove of perspectives). There’s an element of “I’m not crazy, it really is hard!” that benefits from more voices. PR for myself and my team — This is selfish and that is 100% okay! Writing and speaking have been a huge boon to recruiting efforts when I managed teams, and have also proven to be a great way to find new clients for my coaching practice. Sharing is a way to let people know who you are, how you view the world and why they should work with you. 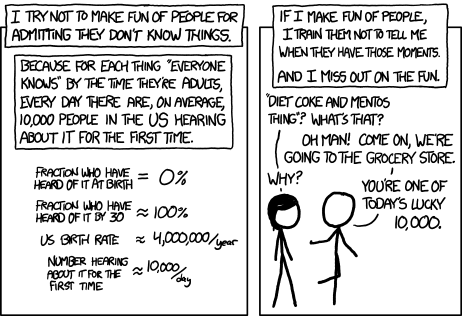 For each thing ‘everyone knows’ by the time they’re adults, every day there are, on average, 10,000 people in the U.S. hearing about it for the first time. Maybe there truly are a hundred articles about your topic written over the years. But you never know who you might reach with yours. Old articles aren’t being actively shared or propagated, and require someone purposefully sifting around the web for them. You writing or talking about your experience — in your particular role at your particular company at this particular point in time — may re-tread some of the same ground, sure. But if you can reach even one person and make them feel less crazy, less alone or give them ideas for how to approach their work, I personally believe it’s worth it. There have been times I’ve written a post and the only real response I’ve gotten is a single person DM’ing me to say it helped them out. Other times, I’ve gotten zero responses and then a year later had someone at a conference tell me the post resonated with them. Originality, amount of views, retweets, etc. are all far less important than the real-world impact you can have by sharing what you’re learning. The last thing I’ll say is that getting comfortable sharing and bypassing those doubts takes practice. When I did my first conference talks, the fear was akin to the way I feel watching a horror movie (I don’t like it! My fight or flight response went crazy!). Nowadays I still have fear, but it’s converted (over the course of many years, blog posts, interviews and conference talks) into the feeling I imagine comes along with skydiving. It’s more of a rush and I look forward to it rather than dreading it. That may not happen for everyone, but I do believe if you feel passionate about sharing your work that it’s possible to do that in ways that work for you and allow you to get more comfortable with putting yourself out there. For instance, I started out by writing (which was most comfortable for me) and eventually eased my way into speaking. Maybe you start with tweeting more often, or designing things you’re proud of to share on Instagram or Dribbble. However you decide to start, the important thing is to start putting things out there so you can find your voice, get comfortable sharing and start reaching and impacting the community you’re a part of.